In the above photo, Katie practices Shark Drill sans buoy. She’s crazy!!! I’ll be honest, this version of shark drill is different than the shark drill that Katie and I grew up with. This is a drill that our fellow water blogger, Vicky, taught us and it is geared towards more advanced triathletes/ swimmers. It can be swum with or without a pull buoy – we recommend the pull buoy for most athletes. Purpose: The purpose of this drill is to focus on breathing/ balance in the water and finishing your stroke completely. Wear a pull buoy and begin swimming freestyle with one knee bent, so that your foot and shin are held above the water line. Try to keep everything below your knee dry during the duration of the drill. Practice bilateral breathing, either every 3 or every 5 strokes. Don’t practice sighting during this drill. 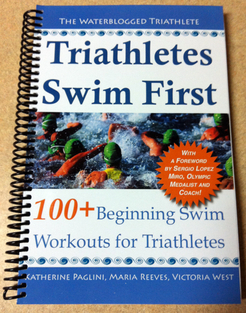 Alternate legs by 25 in a pool environment or by counting strokes in open water. Make sure you breath every 3 or 5 strokes so that you give yourself the opportunity to focus on correct body balance during each breath. The buoy will help the swimmer focus on their front quadrant and balance in the water by simulating that “downhill” feeling that is recommended during freestyle. Pay attention to differences between the right and left side of your body: people who favor one side won’t be able to finish their stroke or get their arm all the way out of the water during their freestyle rotation. Make sure you finish your stroke at (or slightly past) your hips on both sides. Pretend you have a pole running from your head to your feet and allow your body to rotate on that pole. If it helps to use the buoy as a physical marker of that line, use it as your point of rotation. If the drill is too easy, feel free to drop the buoy. ‹ Do You Have Any Open Water Fears? I finally got a chance to try this drill. It’s challenging and fun. And it was much smoother when I relaxed. All good except for the calf cramp! Again: must relax. Definitely easier with the buoy. Great to try something new, and even better when I get to play shark. Thanks! I’m glad you liked it! This is a new one for Katie and I too. Vicky’s got some good drills up her sleeve! What’s your favorite drill? Calf cramps while swimming are so annoying. Do you ever get them in your toes too? I get these awful toe cramps and will spend a 25 trying to “kick it out” but the only thing that helps is pushing off the wall. It feels good for a few strokes and then the process repeats itself. They don’t hurt as bad as the calf ones, but they’re so obnoxious! I like catch-up drill, and, since I’m a sucker for a nice defined tricep mucscle, I like the drill where you really concentrate on that last push past your hip – does it have a name? And double-kick breaststroke. I just call that one “finishing drill,” but it might have different names in different places. I like that one too. Single Pull Double Kick is a good one – I also like breaststroke with dolphin kick a lot. I’m going to try the hot yoga for a month (special deal! ), and see how it goes. I felt pretty good after. Yes, I’d recommend trying it to see what you think. Why not, right? !